No one wants to cook all of the time. Some days, you just want to kick back and relax, either by ordering in a takeaway or heading out to a delicious establishment near you. But how do you know where the best places to dine are? Sure, you can ask your friends or simply take the plunge and try somewhere new, but sometimes you could do with more focused help. We take a look at 10 of the best apps for recommending great places to dine. Yelp is one of the biggest and brightest services out there. While it has a lot of buzz and hype, its growth has been mostly due to the fact that it’s such a great app. Offering over 50 million reviews for businesses across the world, you can easily search for nearby restaurants, read plenty of reviews, and even view great local deals and photos of the place. Search filters ensure that you can narrow things down according to distance, price, and rating, so you know exactly what you’re getting into. It works well for plenty of other establishments too. Another mighty behemoth, Foursquare has been a huge success in recent years. While you’d be forgiven for thinking it’s so that you can semi-stalk your friends and compete to become ‘mayor’ of various places, it’s also a great tool for finding new places to eat at. You can follow people whose tastes you trust so their tips show up first, along with advice on what to order. You can also tell the app what your favorite things are and it’ll tailor its results to your needs, ensuring you’ll only see the places you want to see. A good taco has surely never been so easy to track down, right? You don’t always want to go out to a restaurant. Sometimes, you just want to stay indoors and have the food come to you, thereby saving you the effort of dressing up (or at all). 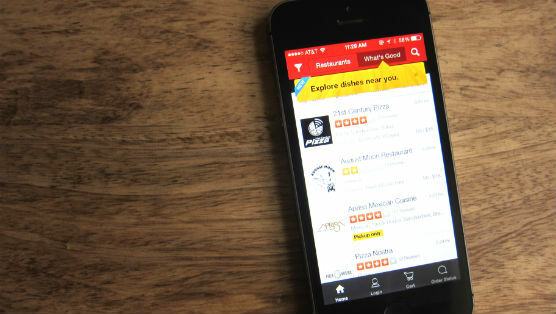 EAT24 is the app you need in this instance, giving you the ability to order food from over 25,000 different restaurants across more than 1,500 different cities. You can search for specific cuisines but more impressively, you can look up particular dishes, before browsing delicious food photos to see what tantalizes your tastebuds. EAT24 will even allow you to securely store your payment details so you don’t have to worry about remembering your credit card numbers. It’s ideal for that Netflix binge watch. Allowing you to compare restaurant choices by rating, distance, cuisines and popularity levels, Urbanspoon is a great help, especially when you’re in a new city. You can browse menus and photos of the food on offer, as well as look at online restaurant guides by critics as well as other food fans. You can even make reservations using the app, ensuring it’s the Swiss Army Knife of dining apps. It’s stylish too. Sometimes, less is more. Zagat gives you concise reviews of restaurants and bars, saving you the hassle of having to dig around too much. The usual filters are place along with a scoring system that rates food, decor, and service separately. Lists of expert-selected places to cover mostly any occasion, mood, or craving completes the well-rounded package, so you can spend more time eating and less time browsing. OpenTable takes out all the hassle of booking a reservation at your favorite restaurant. You can simply choose a date, time, and party size to see available tables at your desired location, then hit the book button. It’s easy enough to find a restaurant based on your location or cuisine needs, and OpenTable offers plenty of helpful reviews and rating options. You can even invite your friends through the app, as well as add reservations to your calendar. LocalEats doesn’t list every restaurant possible. Instead, it focuses on the best of the bunch with editors considering ratings from magazines, newspapers, and dining sites to work out what should be suggested. Its curated list manner means you don’t have to work your way through the poor restaurants to get to the good. The app focuses on local restaurants too rather than including national chains. A Top 100 picks according to city means you should be well catered for here. A handy app to double check before you book somewhere, DiningGrades rates restaurants on perhaps the most important factor—their cleanliness. The app makes it easy to browse through user provided comments and a scoring system to check that the restaurant you want to go to is also clean and satisfying, as well as tasty. It’a small but important step in stopping you feeling not so great the morning after. Covering over 4,500 destinations in more than 150 cities and towns, Find. Eat. Drink. even includes restaurants in Mexico and the Caribbean. Recommendations come from a network of professionals, including top tier chefs, butchers, food purveyors, and bartenders. It’s easy enough to make customized lists too, proving ideal for when you’re planning that exciting vacation soon. Simply named, Restaurant Finder doesn’t stop at covering the USA and Canada, with plenty of restaurants to find across Europe, as well as Australia, Brazil, Malaysia, and other countries. In each case, it’s easy to find places near your location, plus there are extensive reviews for them all, ensuring you can always find somewhere tasty to eat locally. It’ll even give you the heads up on nearby grocery stores if there aren’t any convenient restaurants or bars near.